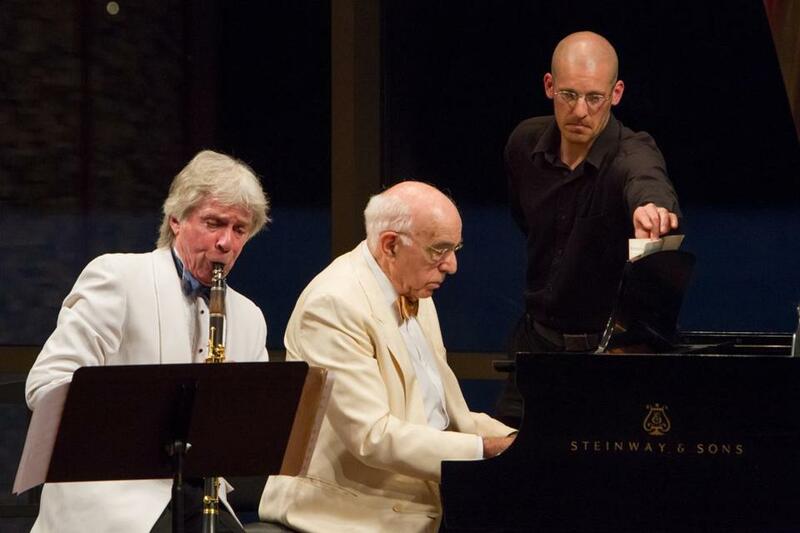 Clarinetist Richard Stoltzman and pianist Yehudi Wyner performing at the Shalin Liu Performance Center. ROCKPORT — The classical music world is delineated by degrees of separation: who taught whom, who knew whom. Richard Stoltzman, the veteran clarinet luminary, built his recital in Rockport on Friday around such connections — and multiplied them, calling on both Rockport Music artistic director David Deveau and composer Yehudi Wyner as pianists. Stoltzman even managed to weave in the place itself, opening with Peter Sculthorpe’s 1987 “Songs of Sea and Sky,” originally written as a tribute to Stoltzman’s own teacher, Keith Wilson, the imagery expediently echoing the harbor view through the stage’s glass backdrop. Sculthorpe’s variations on a South Pacific song alternated between musical aggressiveness and comfort: Stoltzman playing into the piano, honking the strings into resonance; Deveau spinning a nostalgic hymn which Stoltzman effaced with twittering birdsong; fractious accents given a gently grand resolution. Wyner and Stoltzman, longtime colleagues, seemed to ruminate in tandem while tracing Wyner's musical lineage. The 1939 Sonata by Wyner’s teacher, Paul Hindemith, coursing with well-balanced neo-classicism, was given sturdy, rich treatment; Wyner’s own “Commedia,” from 2003, uses recognizably similar language, but in more free-range fashion, veering from mood to mood with casual volatility. It was tailored to Stoltzman’s idiosyncratic sound and style, tone triangulating between the instrument’s concert-hall purity and its more florid jazz personality, communication generous but also almost reflexively intimate. Bonds of friendship filled out the program. The historical representatives were Robert Schumann and Johannes Brahms. On the first half, Deveau and Stoltzman joined for a dark-hued and deliberate reading of Schumann’s Op. 73 “Fantasiestücke”; Stoltzman and Wyner closed the concert with an exploratory version of Brahms’s F minor Sonata (Op. 120, No. 1), mercurial, spontaneous sometimes to the point of capriciousness, all fluid rhythms, sudden shifts, and expansive reflection. But more recent, personal history was immediate and raw. Stoltzman programmed the “Largo” from William Thomas McKinley’s 1986 Clarinet Sonata as a memorial to that longtime close colleague and friend, who died in February. The clarinetist offered some genial remarks (as did Wyner, at the keyboard, while Stoltzman went in search of his music). But with the preliminaries done, Stoltzman was overcome with grief, and it was some time before he could compose himself — and, after a performance that was both elegant and fierce catharsis, some time before he could continue to the next piece. Compositions live on, making connections from generation to generation. But the creators, inevitably, leave us, and leave us behind.